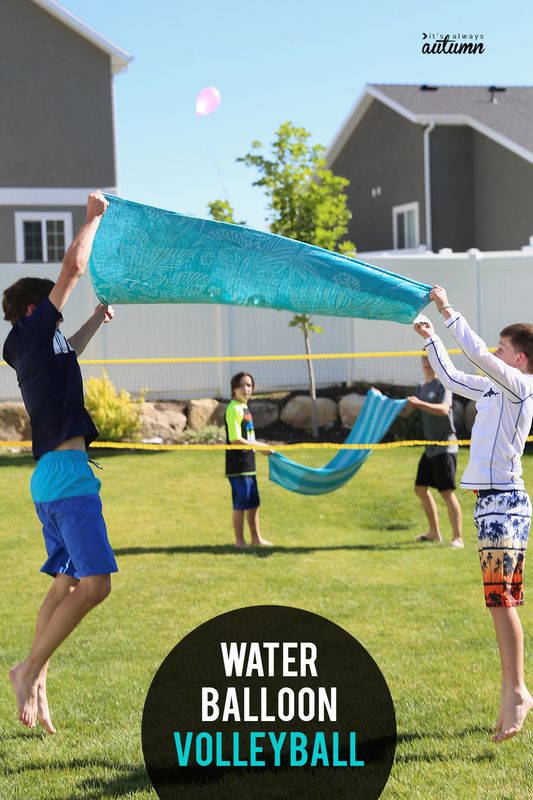 Water balloon volleyball: hilarious summer water game! 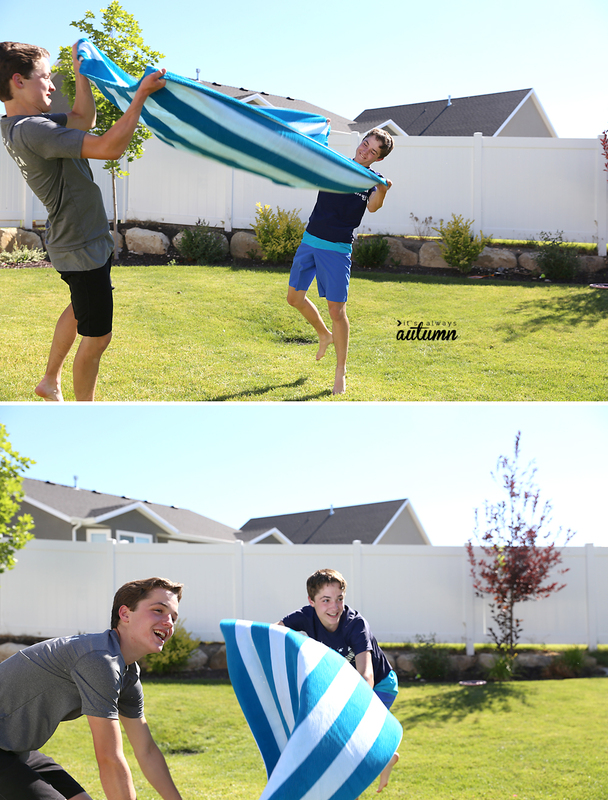 In today’s post: Water balloon volleyball is a fun outdoor game that’s perfect for summer parties and family reunions! My kids beg for water balloons every summer. And, being a nice mom, I get them some every summer. And then I promptly regret it. Because, of course, five minutes into any water balloon fight someone is ALWAYS crying. Someone threw a water balloon right at their face, or someone threw one too hard, or it’s not fair because he’s filled up more than I have, and on and on. And then I’m not such a nice mom anymore because I’ve decided never to buy water balloons again! But this year I think I may have found the solution to my water balloon troubles: water balloon volleyball. 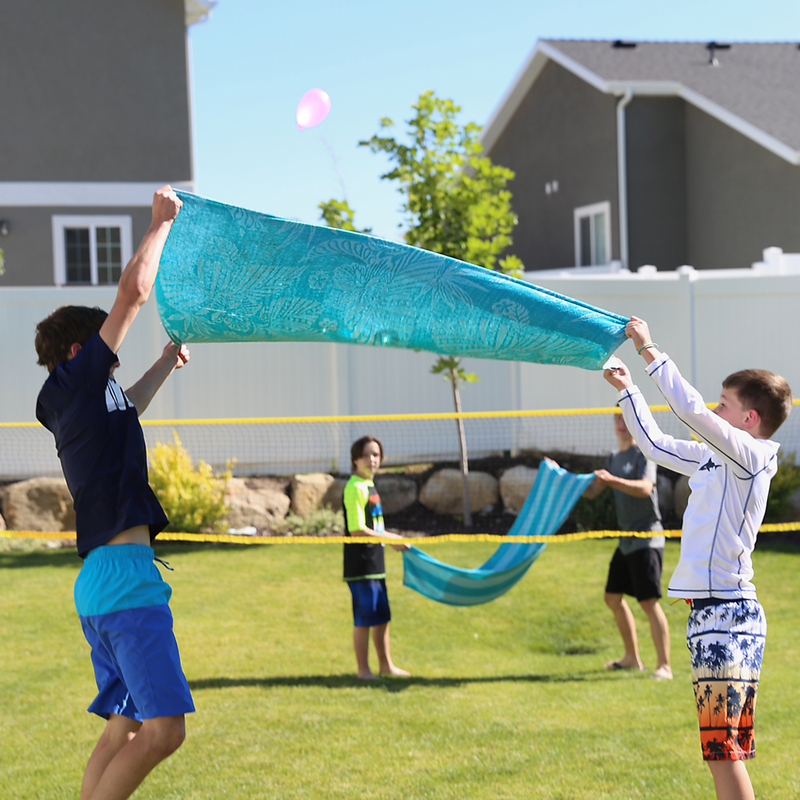 Water balloon volleyball is way more fun than a plain old water balloon fight. Kids have to work together to make it work, instead of just pelting each other, so there are fewer hard feelings. And since the balloons are getting tossed back and forth (instead of thrown as hard as possible), there’s less chance of anyone getting hurt. 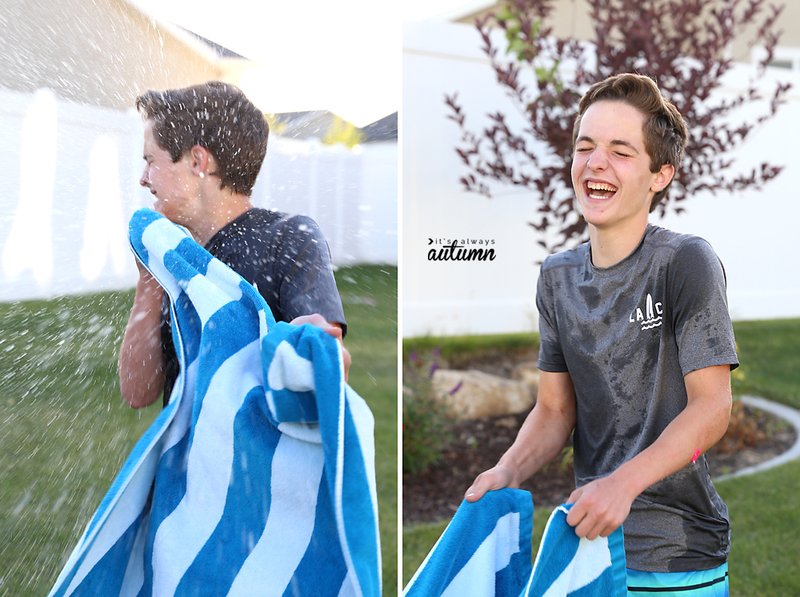 But there’s still plenty of popping water balloons, which means it’s still plenty of fun! Split up into pairs of two. Each pair needs a towel. 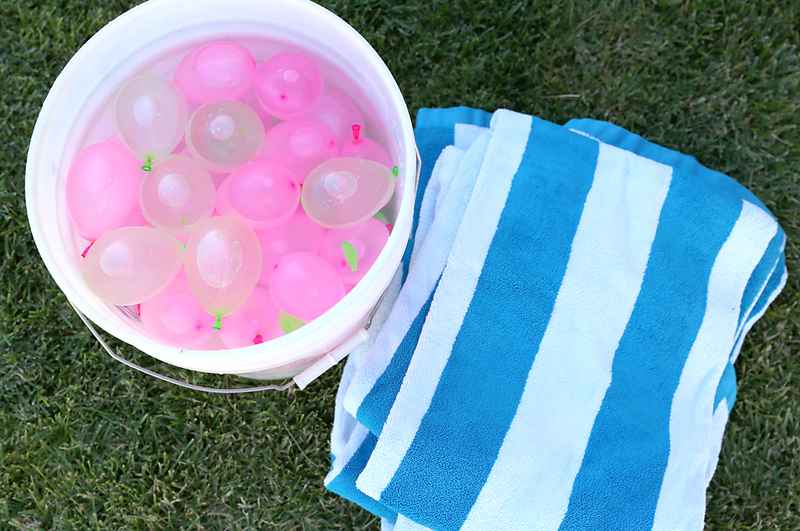 Make sure you have plenty of water balloons ready. If you have a volleyball or badminton net, set it up. If you don’t, you can still play! The kids on the other side try to catch the balloon in their towel and send it back. We like using the Bunch O Balloons water balloons because they are so fast to fill up! That’s an affiliate link to where you can find them on Amazon, but I found a better deal on them at Costco. You can play with as few as 4 people (one pair on each side), or as many as your yard can comfortably accommodate. If you have an odd number of people, designate one person as a “balloon runner” who brings a new balloon each time the old one pops. Rotate the runner every few minutes. The game is ideal for teens and tweens because they will have the coordination necessary to be successful. 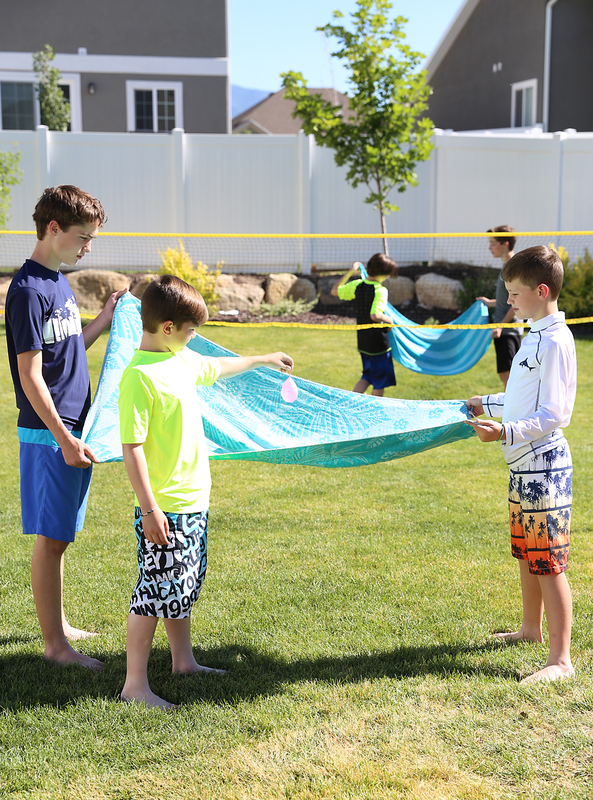 If younger kids want to play, ditch the net and let them stand closer together and use a slightly smaller towel to make the game easier. Keep score if you’d like: one side earns a point when a water balloon pops on the other side. « Make an origami frog that really jumps!